Modern alley cropping designs, with trees aligned in rows and adapted to operating farming machinery, have been suggested for Europe. 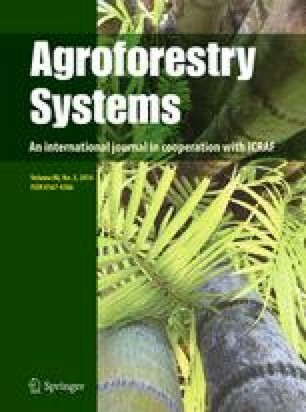 This paper explores the potential for adoption of cork oak (Quercus suber L.) agroforestry in Portugal and estimates the potential carbon sequestration. Spatial modeling and Portuguese datasets were used to estimate target areas where cork oak could grow on farmland. Different implementation scenarios were then modeled for this area assuming a modern silvoarable agroforestry system (113 trees ha−1 thinned at year 20 for establishing 50 trees ha−1). The YieldSAFE process-based model was used to predict the biomass and carbon yield of cork oak under low and high soil water holding capacity levels. Approximately 353,000 ha are available in Portugal for new cork oak alley cropping. Assuming implementation rates between 10 % of the area with low soil water capacity (60 mm: 15 cm depth, coarse texture) and 70 % of the area with high soil water holding capacity (1,228 mm: 200 cm depth, very fine texture), then carbon sequestration could be 5 × 106 and 123 × 106 Mg CO2 respectively. Due to higher yields on more productive land, scenarios of limited implementation in high productivity locations can sequester similar amounts of carbon as wide implementation on low productivity land, suggesting that a priori land classification assessments can improve the targeting of land and financial incentives for carbon sequestration. This study was funded under the Portuguese National Science Foundation (FCT) under the contract SFRH/BPD/26346/2006, the FCT scientific funding program “Programa Ciência 2008”, the FCT projects (a) Cork Carbon Footprint (PTDC/AGR-FOR/4360/2012) and (b) Models and Decision Support Systems for Addressing Risk and Uncertainty in Forest Planning (PTDC/AGR-FOR/4526/2012); and under the European Union project AGFORWARD (Agroforestry that will advance rural development, grant agreement 613520). We would like to thank to the anonymous reviewers and Paul Burgess who provided helpful comments. The support is gratefully acknowledged.